Long time buyer, first time writer. Over the years I’ve struggled each time I’ve decided it’s time to to buy a new ThinkPad. I’ve struggled because it used to be difficult to choose from so many solid entries in the T, X, and W lines. These days I’m looking at lenovo.com and struggling to find a laptop computer anyone is happy to own. Take a look at stars on the T series. The combined score is 12 / 20. We’ll round up the stars in the X series and give these ultrabooks a combined score of 13/20. These scores are in the “meh” category, and not what I’d expect from Lenovo’s flagship and premium brand. Reading through the reviews you’ll find most people are happy with the performance, the battery life, the selection of ports, and the build quality. But I’m sure you’ve also noticed the copious rants about the keyboards you are designing and shipping on today’s models. Perhaps we expect more from ThinkPads because the ThinkPad name was synonymous for “great keyboard”. Perhaps that’s why shortcut key aficionados were drawn to the ThinkPad line in the first place. We don’t need mice or track pads when we can use Alt+F4 or Alt+Insert to make things happen. Now you’ve removed the Insert key from the X1 and turned the function keys into a capacitive flat-strip LED light show. And moving the Home and End keys to the left side of the keyboard? I have no words to describe my sadness. I’ll instead use Peter Bright’s words from his article “Stop trying to innovate keyboards. You’re just making them worse”. Maybe the world has changed and the majority of productive professionals and do web conferences all day and Netflix movies all night. Perhaps this is the product line you need to stay alive in a world where the majority are consumed by consumption and touch. Yet, I hope moving forward you will delight customers with qualities and features that are unique to ThinkPads, and not continue with these innovations that transform your products into inferior imitations of other brands. Scott, I completely agree with you. I remember the days when we were using desktops and wired keyboards. This keyboard innovation madness started pretty long back. I had gone mad searching for old standard keyboard because most new models had messed up with Insert / Delete group position and alignments. Only we can feel the pain. Thanks for writing. No context menu key on w530? CapsLock with no indicator if it's on or off? Seriously? If only Lenovo were alone in this. My Dell XPS 12 actually has the Home, End, Page Up, and Page Down keys on the *arrow* keys, so you have to hold down the Fn key in order to do Home, End, Page Up, or Page Down. I would've thought Dell had some programmers on staff who could explain how wrong that is. my x1 carbon keyboard is already broken. some keys just stuck there after you pressing it. I'm already having to stare at my fingers when I go to use home/end/ins/del on my current X1 - they're in a row at top right. Also, I have always remapped PC keyboards' Caps Lock to Ctrl because nicer. Looks like I'd now have to map both Home and End to Ctrl - and then where do I put Home and End? What I want in a laptop keyboard: Same layout as the most standard PC keyboard, except tenkeyless. The keys can be quite flat, as long as they have decent feedback. I'm comfortable with the keys on ThinkPads and Macbooks. It's just that the layout has to remain standard. If people want to remap keys, let them, but stop moving the physical keys around! 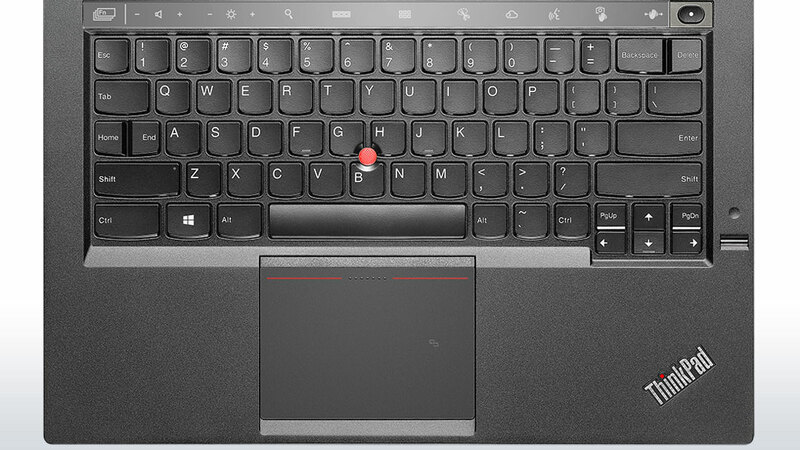 Maybe Lenovo should offer a 'developer layout' keyboard for sale to go with each ThinkPad. What? No mention of supersize power supply? The adaptive keyboard on the Haswell Lenovo Carbon X1 was such a disappointment. I tried so hard to like it. Its primary point of failure was the loss of tactile feedback that you get from pressing a real key. I have happily returned to my Dell Precision M6500 running Windows 7. I tried hard to like Windows 8.1 too and it is nice in some ways but it is so nice to have my Snipping Tool working correctly again on a multiple monitor setup. Hey Scott, We bought 7 X1s for my team and others at my work. The technician is coming in tomorrow to repair 4. That's a pretty bad ratio. I never believed in 'a batch of bad devices' until now. The keyboard itself is actually pretty nice in my opinion... I mean, would I have tried to innovate a keyboard? No. But the keys are nice, and home and end on the opposite side of what I'm used to *will* take some getting used to, but I never used caps lock before. I'm just so disappointed in the service, the batch of lemons we got, and the sheer contrast to what I'm used to from Lenovo. I have a Yoga 2 Pro as my personal laptop, and I couldn't be happier! It's like they were made by two different companies!! Just to put a bit of contrast ... I've known several people who have the X1C and find it to be stellar. I would have invested in one if it was available when I was making my purchasing choice, but I ended up going with the Yoga. Keep in mind that's not a workstation which is what I think you are looking for, but even with a "modest" 8 GB of RAM this is hands-down one of the best machines I've owned and a big plus is the keyboard and track pad. My experience was similar to PeteK68 regarding that ... so the bottom line is I think there are good ones out there, and I do wonder if some of the negativity isn't more around the shock of Windows 8 than the machines themselves. Of course I've found that the best keyboard is ... the one you're used to. Never easy to make a switch. I'm on the same page as Jeremy Likness, I know several X1C owners, both Gen1 and Gen2 and all I hear are raving reviews. Yes, there were some adaptation issues regarding the new adaptive keyboard and clickpad on the G2 machine, but I also heard, and even participated myself in the uproar against the chiclet keyboards that were introduced with the XX30 series, as I am forever a fan of the 7 row classic keyboard, and that is what made my decision to get a W520 rather than the, at that time, just introduced W530. Don't regret that decision for a single moment. But, I recently got myself a T440s for interim travel tasks while deciding on what I'm getting to upgrade my W520, and I really like it. It's a snappy machine, with great hardware options, I went for the i7-4600U - FHD non touch, running it with 8GB RAM, which is more than enough for what I use it for, and it has proven itself as a very trusty companion, and a great addition to my ever growing collection of ThinkPads. That being said, I would really love it if the workstation models, the W- and the T- series would allow an option for keyboard selection. That would be an ultimate nod to us long-time users. I have had the Haswell X1 since release. I like the keyboard and touchpad.. As a developer, I *hate* the adaptive keys--no matter how hard I try to get used to them--they still slow me down on a regular basis and lead to lots of mistakes. After reading the article (or open letter) and other similar I think I am the one living on a different planet. I was a happy user of ThinkPad R400 (personal), then I was even happier user of T420s (personal) and T420 (work). Recently I switched to T440s and I am even happier now - lighter, smaller, longer on battery. Maybe it is because I have never been so much into F keys - I am no programmer, so Alt+F4, F5 for browser and F9 for Outlook is all I need. But I work with the laptop all day every day (in the office in dock, on the road and at home) and I have to say I am happy. The keyboard is great to type on (actually for me the chiclet ThinkPad keyboard is even better than the one I had on T420s), I got used to the TrackPad really fast (which I was afraid of). My girlfriend loved the new X1 Carbon so much that she is switching from T520 (!!) right now. They really should not have messed with the keyboard a few revisions ago -- I just upgraded one of the laptops to a T430s and I still keep missing key combos involving things to the left of the spacebar. Physically, one can swap the keyboard trays. Hopefully someone at lenovo will wake up and realize that there is a group of professionals who would likely pay extra to turn back the clock and get their thinkpad keyboards back. Or someone will start making drop in clones . . . In my case i'm very happy with my X1. i saw in the article most people are happy with the performance, the battery life, the selection of ports, and the build quality and then desqualify the keyboard, seriously? only for moving few keys most of us use once a year? The best keyboard I ever had was an ibm pc xt keyboard. Guess this was some 25 years ago. I changed computers, but the keyboard stayed. Even had to resort to adapters to make it work on newer machines. Going to throw my hat in to the ring. I own a first generation X1 Carbon, and as a device, it makes me so happy there are days I could cry. The keyboard is superb, the hardware is great and things are where they should be. I'm a coder, and as Jeff Atwood says, we are typists first, coders second. The keyboard under my fingers is absolutely vital to my daily grind. So when Lenovo announced the latest X1C Touch, my heart sank. Capacitive function keys are useless to me, and to me, that Caps key was fine - I used it as a second mapped control key. Replacing the Caps with Home/End is a deal breaker, I can't now use that keyboard without sacrificing Home and End keys. Dear Lenovo. You have shown to make absolutely superb keyboards. You've shown it in the the previous generation of the same product. Please don't try to innovate too much here, accept that you're making typing machines first, and touch machines second. I love my Lenovo U540, it's not one of the fancy dev machines, only 8Gb of RAM and I opted for the 1TB hybrid drive rather than SSD because my life is a waste and I have plenty of time to wait for a 30 second compile or a minute-and-a-half startup. The keyboard did take a little getting used to, mainly because it has a full size KB with a numeric keypad. But at least the function keys are real keys. T440s - I used this for the pas year - very solid and reliable machine! Not perfectrr display or sound build in, but the keyboard, size and weight rocks!